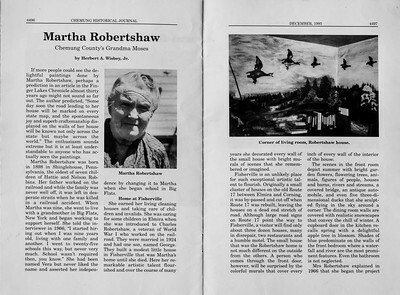 If more people could see the delightful paintings done by Martha Robertshaw, perhaps a prediction in an article in the Fingler Lakes Chronicle almost thirty years ago might not sound so far out. The author predicted "Someday soon the road leading to her house will be marked on every state map, and the spontaneous joy and superb craftsmanship displayed on the walls of her house will be known not only across the state but maybe across the world." The enthusiasm sounds extreme but it is at least understandable to anyone who has actually seen the paintings. Martha Robertshaw was born in 1898 in Shinglehouse, Pennsylvania, the oldest of seven children of Hattie and Nelson Robbins. Her father worked on the railroad and while the family was never well off, it was left in desperate straits when he was killed in a railroad accident. When Martha was nine, she went to live with a grandmother in Big Flats, New York and began working to support herself. She told the interviewer in 1996, "I started hiring out when I was nine years old, living with one family and another. I went to twenty-five schools this way, but was never very much. School wasn't required then, you know." She had been named Vera but never liked the name and asserted her independence by changing it to Martha when she began school in Big Flats. She earned her living cleaning houses and taking care of children and invalids. She was caring for some children in Elmira when she was introduced to Charles Robertshaw, a veteran of World War I who worked on the railroad. They were married in 1924 and had one son, named George. They built a modest little house in Fisherville that was Martha's home until she died. Here her remarkable artistic talent flourished and over the course of many years she decorated every wall of the small house with bright murals of scenes that she remembered or imagined. Fisherville is an unlikely place for such exceptional artistic talent to fluorish. Originally a small cluster of houses on the old Route 17 between Elmira and Corning, it was by-passed and cut off when Route 17 was rebuilt, leaving the houses on a dead end stretch of road. Although large road signs on Route 17 point the way to Fisherville, a visitor will find only about three dozen houses, many in disrepair, two restaurants and a humble motel. The small house that was the Robertshaw home is not much different on the outside from the others. A person who comes through the front door, however, will be surprised by the colorful murals that cover every inch of every wall of the interior of the house. The scenes in the front room depict summer with bright garden flowers, flowering trees, animals, figures of people, houses and barns, rivers and streams, a covered bridge, an antique automobile, and even five three dimensional ducks that she sculpted flying in the sky around a corner. The dining room walls are covered with realistic snowscapes that convey the chill of winter. A cupboard door in the kitchen recalls spring with a delightful apple tree in blossom. Shades of blue predominate on the walls of the front bedroom where a waterfall and river are the most prominent features. Even the bathroom is not neglected. 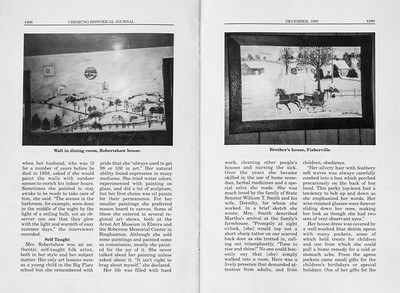 Mrs Robertshaw explained in 1966 that she began the project when her husband, who was ill for a number of years before he died in 1958, asked if she would paint the walls with outdoor scenes to enrich his indoor hours. Sometimes she painted to stay awake to be ready to take care of him, she said. "The scenes in the bathroom, for example, were done in the middle of the night by the light of a ceiling bulb, yet an observer can see that they glow with the light and warmth of easy summer days." the interiewer recorded. Mrs Robertshaw was an authentic, self-taught folk artist, both in her style and her subject matter. Her only art lessons were as a young child in the Big Flats school but she remembered with pride that she "always used to get 98 or 100 in art." Her natural ability found expression in many mediums. She tried water colors, experimented with painting on glass, and did a bit of sculpture, but her first choice was oil paints for the permanence. For her smaller paintings she preferred mason board to canvas. Some of these she entered in several regional art shows, both at the Arnot Art Museum in Elmira and the Roberson Memorial Center in Binghamton. Although she sold some paintings and painted some on commission, mostly she painted for the joy of it. She never talked about her painting unless asked about it. "It isn't right to brag about myself," she declared. Her life was filled with hard work, cleaning other people's houses, and nursing the sick. Over the years she became skilled in the use of home remedies, herbal medicines and a special salve she made. She was much loved by the family of State Senator William T. Smith and his wife, Dorothy, for whom she worked. In a brief sketch she wrote, Mrs. Smith described Martha's arrival at the family's farmhouse. "Promptly at eight o'clock, [she] would tap out a short sharp tattoo on our scarred back door as she trotted in, calling out triumphantly, "Time to rise and shine!" No one could honestly say that [she] simply walked into a room. Hers was a lively presence that demanded attention from adults, and from children, obedience. "Her silvery hair with feathery soft waves was always carefully combed into a bun which perched precariously on the back of her head. This perky top-knot had a tendency to bob up and down as she emphasized her words. Her wire-rimmed glasses were forever sliding down her nose, making her look as though she had two sets of very observant eyes." Her house dress was covered by a well-washed blue denim apron with many pockets, some of which held treats for children and one from which she could pull a home remedy for a cold or stomach ache. From the apron pockets came small gifts for the children's birthdays or special holidays. One of her gifts for the family were some willow shoots that she had rooted and which were planted with proper ceremony. Today Smithome Farms in Big Flats has a memorial to Mrs. Robertshaw in the form of a magnificent weeping willow tree that grew from those small shoots. Mrs. Robertshaw was deeply religious. Mrs. Smith remembers "The Lord was praised for everything good and Satan damned for all evil in a highly pitched soprano voice that did not lack for power. Singing all five verses of hymns as she methodically scrubbed away she claimed helped chase the dirt and Satan away." The Smiths felt that when she finished her cleaning the family was not only sanitized but morally uplifted. "I started religion in Fisherville," Mrs. Robertshaw told the interviewer for the Finger Lakes Chronicle. "We had Bible Classes in my house. That was before we built the church." The Church was the Fisherville Baptist Church, a small one-room building not far from the Robertshaw house, constructed by neighbors. Mrs. Robertshaw painted a mural that covered the entire wall behind the altar. In the center is a stained glass window that she designed, showing the head of Christ. The central feature of the mural is a river that brings to mind the scriptural "River of living waters." On one side is a large green tree that could represent the tree of life and on the other is Calvary with three white crosses that stand out from the background of green. The building still stands, the mural intact, but it is no longer a church and it saddened her last years. It has since been remodeled as a private dwelling. Martha Robertshaw never received much recognition as an artist in her lifetime, and her death in 1989 at the age of 90 was unnoticed except for family members and a few of the people for whom she worked. The Elmira newspaper failed to print a special obituary noting her achievements as an artist. She was buried in Woodlawn Cemetery beside her husband. Her son lived in the Fisherville house until his death last year. It is now owned by his son, Dan Robertshaw, who lives in another house on the same property. Dan is interested in preserving his grandmother's paintings. The house with the paintings is lived in at present but it needs a considerable amount of upkeep. The paintings were done on plastered walls and cannot be moved, so their fate is tied to that of the structure itself. The house and its paintings would make an interesting small museum, but such a project would require a lot of money as well as expertise. It is unlikely that Fisherville will achieve recognition as the former home of Martha Robertshaw any time soon. But anyone who sees any of her paintings will be interested in this modest woman who brightened the world around her with her imagination and her talent. This article is based on one written by Joyce Lubold, published in the Finger Lakes Chronicle, Vol. 3, No. 12 (November, 1966). 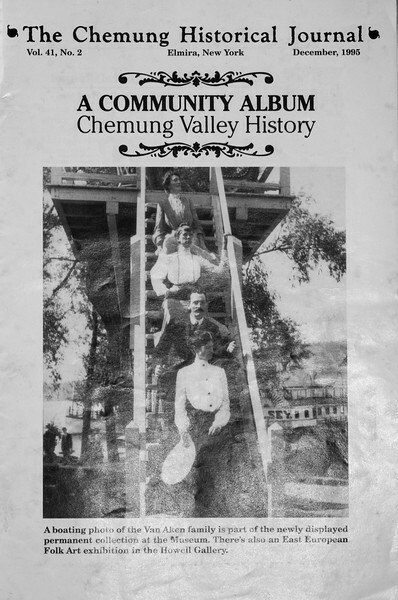 The Chronicle was published in Corning for about four years, thirty years ago. My appreciation to Mrs Lubold for permission to use her material. My appreciation also to Mrs. Dorothy Smith for permission to quote from an unpublished paper that she wrote about Mrs. Robertshaw. 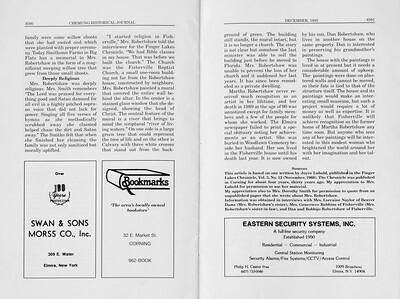 Information was obtained in interviews with Mrs. Lorraine Naylor of Beaver Dams (Mrs. Robertshaw's sister), Mrs. Genevieve Robbins of Fisherville (Mrs. Roberthaw's sister=in-law), and Dan and Bobbijo Roberthsaw of Fisherville.